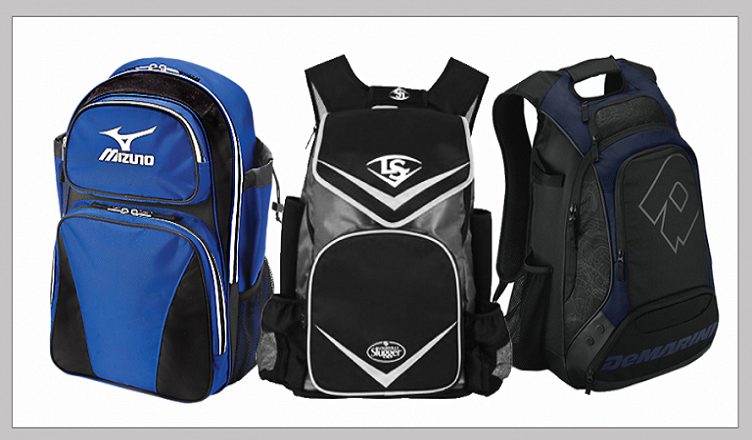 If you are a baseball player, then you know the importance of having the best baseball & softball equipment bags. This is a bag that comes in a considerable size (neither too small nor too large), has a top quality design and is well decorated thus having an attractive and pleasant look. There are lots of these bags currently on the market but only a few meet the set market standards. 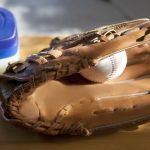 When going for a match or training, you should be able to carry all the necessary baseball equipment without struggling. 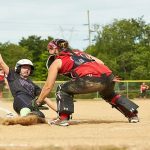 This is what Boombah Baseball Rolling Super Pack enables you to do. It is a spacious baseball bag that is designed to help you carry all your baseball equipment with ease and in an organized manner. It is a heavy duty bag that is made using quality nylon, zippers and j hooks. The bag is spacious enough and comes with a shoe compartment, bat compartment and many other reliable compartments. It is a nice baseball player’s bag that is designed to ease the process of packing and carrying baseball gear. To simplify the process of transporting your equipment, Boombah baseball super pack features heavy-duty bag wheels that run smoothly on both bare and covered grounds. The bag also features a telescopic handle that makes it easy for you to pull it. 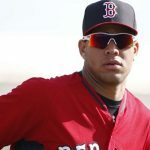 The safety of your baseball gear matters the most and should highly be emphasized on. Rawlings Velo Sporting Goods Backpack is designed to enhance the safety of your baseball gear. It is made using the best materials and technology to ensure that your items are safe when kept inside the bag. Rawlings Velo backpack features various compartments where you can neatly arrange your items. During the game, you can use its main compartment as a shelf. It also comes with a storage pocket that can safely hold a tablet or laptop. The bag is spacious enough for all your equipment. It comes with several external hooks that can be used to hang it on most fences. To hold your bats firmly, the bag features side sleeves on both sides. It also features a beaver tail that can safely hold your shoes or helmet. The bag is a nice backpack that can meet all your needs. Fields get wet from time to time and the baseball bag that you choose should be able to protect your gear from getting wet. Demarini Rebirth Voodoo Backpack features a waterproof bottom material that is composite treated. The bottom is designed to keep your gear dry even when the bag is placed on a wet surface. The bag comes with a spacious main compartment, a ventilated shoe compartment and several other compartments. It has a phone pocket that is fleece lined. The bag has enough room for all your baseball equipment. It enables you to keep your equipment in an organized manner. Demarini Voodoo Backpack features neoprene sleeves with customized barrel locks. The sleeves are designed to safely and firmly hold your bats. They can carry up to 2 bats. With the bag, you can carry your bats, helmets, cleats, gloves and all the other equipment that you may need. A strong bag that is rip/tear resistant can help you keep your baseball equipment safely for many seasons. This is what the Boombah Rolling Brute Bat Bag offers. It is a heavy duty baseball bag that is made using materials of the best quality. The bag is made using heavy-duty nylon and features strong zippers and j hooks. It is rip/tear resistant and comes with two handles that make it easy for you to lift the bag. The bag also comes with large wheels that can roll over any surface. It comes with plastic runners on its base to enhance stability. The bag contains a top compartment, a bottom shoes or helmet compartment, and a spacious main compartment for anything else you may need to carry. For baseball players looking for an equipment bag with a spacious storage as well as a large opening, this Louisville Slugger bag is the best bag to purchase. The bag comes with 2 shoulder straps for carrying the bag conveniently on your back. There is also a comfort padding that ensures that the bag rests on your back and shoulders comfortably. The best thing about this bag is that it has a spacious storage for storing a helmet with a facemask. Ideally, when using incredible Louisville Slugger bag, you can be assured that all your baseball equipment will fit perfectly in the bag. There are also abundant storage pockets for storing other items including personal effects. The Easton Tote Bat Bag is a popular bag among most baseball fanatics. This is because the bag is designed to fit all equipment needed for a game of baseball. It holds two bats, helmet, batting gloves, fielding glove, cleats as well as a water bottle. When using this bag you can be guaranteed that you will not find any tears, snags or rips. The bag is made using superior quality fabrics that are resistant to wear and tear thereby making the bag uniquely durable. The structural piping design of the bag provides a maximum volume within the storage space. There is also a separate pocket that protects valuables such as watches, phones and other personal items from equipment. Like other Louisville Slugger Bags, this amazing 7 stick baseball bag boasts of having a superior design, uniquely strong construction, and roomy compartments. The bag has a pair of mesh pockets for storing additional bats or water bottles. In addition to this, the bag also has a removable personalization panel that you can use for customizing your bag. This 7 stick baseball bag is well built and has amazing storage capabilities particularly for kids. This high-quality bag comes with 2 bat sleeves and a pair of straps for carrying the bag on the back. The bag holds all baseball equipment comfortably. Generally, it is a great purchase that is bound to last for years. Are you looking for a one of kind bat pack with amazing functionality and reliability? If yes, you need to look no further than at this Easton Bat Pack. This sports utility bag has dual zipper design that comes with a fence hook for the convenience of use. 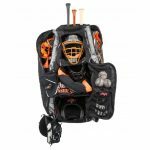 The bag also has an exclusive helmet holder that provides additional space inside the bag for placing baseball equipment and personal items. The best thing about this bag is that it also has an external (padded) side compartment that can be used for storing a tablet, laptop or clothes. In addition to this, the baseball bag also has a top pocket that can be used for storing personal items. The DeMarini Momentum Bag has a holding capacity of up to 4 bats at a time and has one large (main) compartment that fits essential baseball equipment like gloves, helmet, and cleat. The base of the bag is made using water-resistant material combined with an abrasion resistant material. What is more unique about this bag is that it also has convertible shoulder straps that provide for an optional carrying style. The wheeled sturdy base of the bag makes it easy and possible to move around effortlessly with the bag especially on smooth surfaces. This Wilson bat pack comes with a separate shoe bag for purposes of ensuring that the bat pack is clean, dry and well kept at all times. If you want a classy baseball bag for your kid, then this Easton Bat Pack is the best choice for you. Designed using classic Easton technology and workmanship, the ball is durable for a long time and is very roomy thus making it easy to store all your baseball equipment. The polyester material in the bag is top grade and ensures that the bag is resistant to wear and tear. The shoulder straps in the bag are well padded to ensure that the bag rests comfortably on the shoulders without causing any straining on the shoulders. In addition to the large main compartment, the bag also has a smaller compartment for storing personal items. For quite a long time now, Easton has had a good reputation for designing quality sports bags. In line with this spirit, the Easton E500C bag is an incredible baseball bag that is specially designed for use by kids. The bag comes with a telescoping handle that provides for efficient transportation and reinforced straps for stabilizing load disbursement. There are 10 lockable zippers in the bag thus providing maximum durability by preventing blowouts. Additionally, the wide set wheels in the bag come with the full axle that prevents tip-overs. When using this bag, you can be guaranteed to enjoy great comfort and efficiency for a long time. Whether you are simply traveling to the next time for your Holiday league or getting in a professional tournament, a baseball bag can provide a reassurance that when you reach your destination, your equipment will have happy and arrived safely. Hope the above article will help you find the best baseball bags to purchase.